Large, elaborate, two-part belt buckles went out of fashion in Ottoman Turkey and much of the rest of the empire by the early 19th century. Some of these were then converted to hand mirrors such as the example here by taking one half of the buckle and using it as the backing plate for the mirror, which would be atop a lady’s dresser. The example here is decorated with a gilt metal backing inset with carved, tear-drop coral cabochons, gilded silver filigree and applique work, and a central rosette decorated with pale turquoise-coloured enamel. This enamelled boss is tiered and topped by a coral insert. (There is a similar, smaller boss below). The use of enamel in this type of Ottoman filigree work is relatively rare. 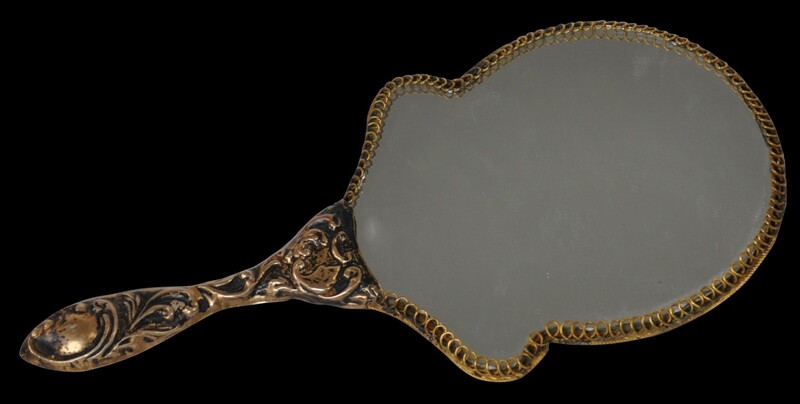 The handle of the mirror is of hollow cast gilded metal. An Ottoman buckle of similar form including the central enamel boss was offered by Sotheby’s, ‘Islamic Works of Art, Carpets and Textiles,’ April 17, 1987, lot no. 361. Another with gilt filigree and coral is illustrated in Istanbul: The City and the Sultan, De Nieuwe Kerk, p. 116. The proportions of the mirror – a round head and a long, thin handle – are in keeping with Ottoman mirrors that date from the sixteenth through to the nineteenth centuries. 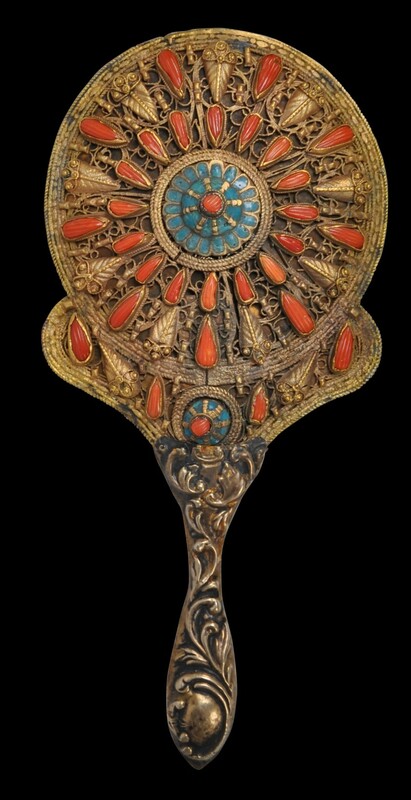 Several examples are to be found in the collection of the Topkapi Palace Museum in Istanbul. These are illustrated in Askit, I., The Topkapi Palace, Askit, 2000, p. 184-5, and Roxburgh, D. (ed. ), Turks: A Journey of a Thousand Years 600-1600, RAA, 2005, p. 328 & 367. The mirror here contains glass that is held in place by gilded wire curls. Askit, I., The Topkapi Palace, Askit, 2000. Roxburgh, D. (ed. ), Turks: A Journey of a Thousand Years 600-1600, RAA, 2005.